CH711’s sleek, sophisticated 360-degree design complements any desktop or décor. 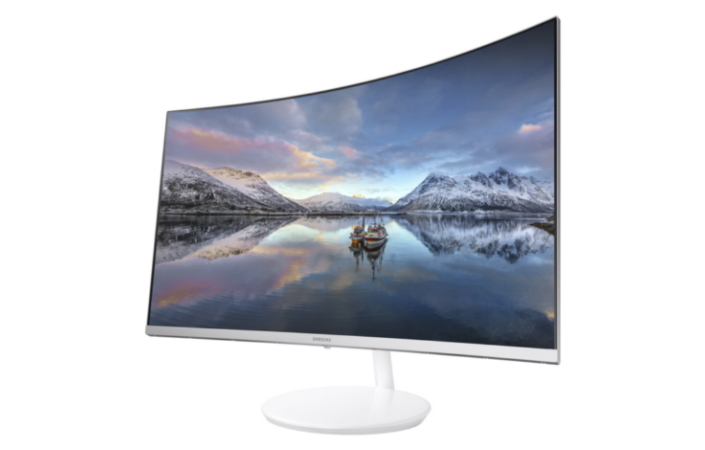 Its clean, white chassis features a gorgeous three-sided Boundless design and neatly hides its power and HDMI cables out of sight inside the stand’s neck.Featuring 1,800R curvature and an ultrawide 178-degree viewing angle, the CH711 makes content clearly visible wherever you may be in a room. When combined with nearly 125 percent sRGB color coverage and 2,560 x 1,440 WQHD resolution, the CH711 sets a new standard for a detailed color appearance at any distance. The 28-inch UH750 monitor combines Samsung’s gamer-friendly features with an ultrafast 1 m/s response time, Quantum Dot picture display and high-quality UHD resolution, all housed within a slim, narrow-bezel design. The 23.8 and 27-inch SH850 models deliver WQHD resolution and DP daisy chain connectivity through a flat, three-sided, bezel-less design with a square base and stylish exterior to suit any home or office. The SH850 monitors also feature a height-adjustable stand and pivot, with tilt and swivel capabilities for optimal viewing comfort. CH711 will be exhibited at Samsung Electronics’ booth along with the recently launched CFG70 and CF791 Quantum Dot display monitors.